Wushu Shaolin Entertainment is world renowned for producing Chinese Cultural showcases featuring the most creative cultural artisans in the industry. The company has produced shows in Saudi Arabia, Qatar, Dubai, and throughout the United States of America. Our presentations are renowned for inspiring men, women, and children. Each showcase takes months of preparation combining music, dance, Wushu, Shaolin Kung Fu, and elaborate Chinese Cultural Costumes. Wushu Shaolin Entertainment is most recognized for producing professional Lion Dance, Dragon Dance, and Shaolin Kung Fu performances. The company serves as a talent agency gathering the leading Chinese Cultural performers to provide clients with the most professional demonstration troupe in the world. 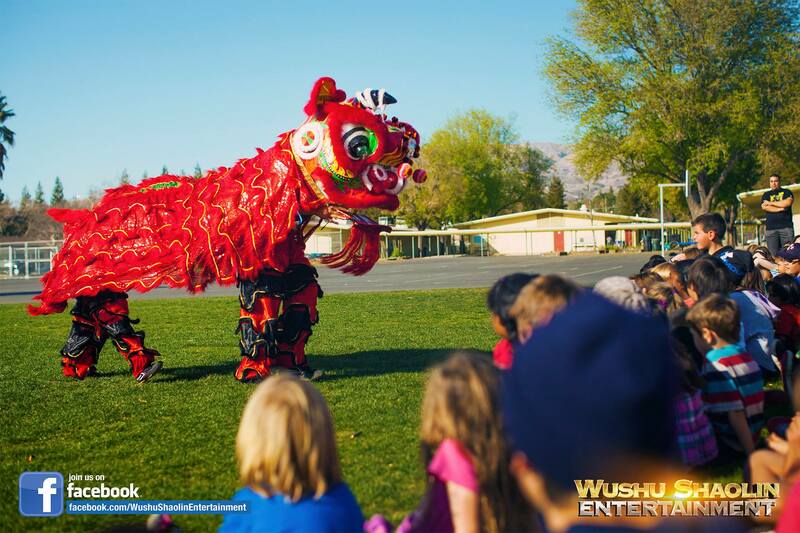 Our team of performers include Shaolin Temple Kung Fu Monks, Black Belt Martial Artist, and industry standard Lion and Dragon Dance performers. 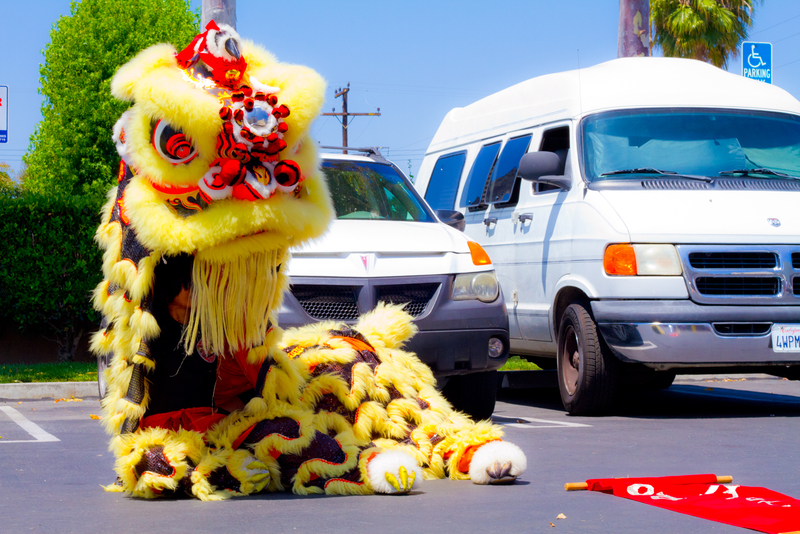 The most professional Lion Dance & Dragon Dance performances in the Los Angeles and South Bay area. These performances are available for weddings, restaurant banquets, festivals, and business grand openings. Please book performances at least a week ahead of time. Each performance is specially customized for the event and surrounding conditions. 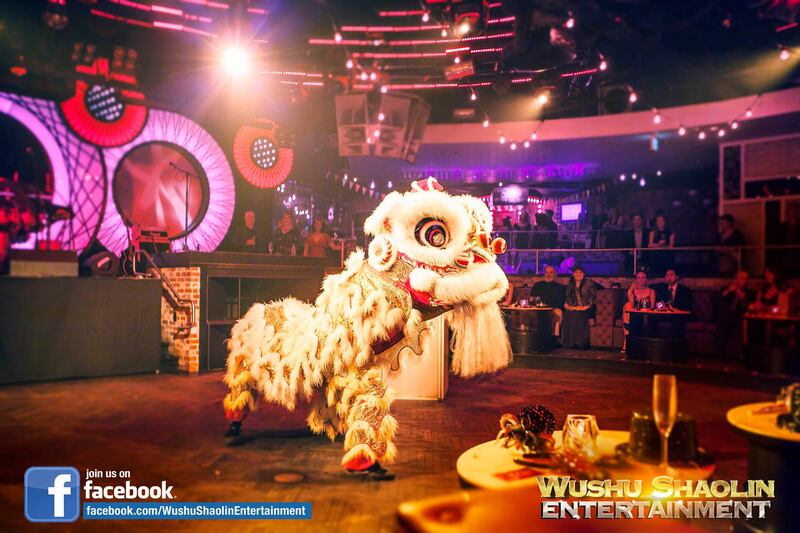 If you are interested in booking a Lion Dance or Dragon Dance performance please visit our contact us page. Pricing is dependent on the number of lions or the size of the Dragon. For performances outside of Los Angeles please contact Wushu Shaolin Entertainment for further details. Separate prices may apply. Lion dance (simplified Chinese: 舞狮; traditional Chinese: 舞獅; pinyin: wǔshī) is a form of traditional dance in Chinese culture, in which performers mimic a lion’s movements in a lion costume. 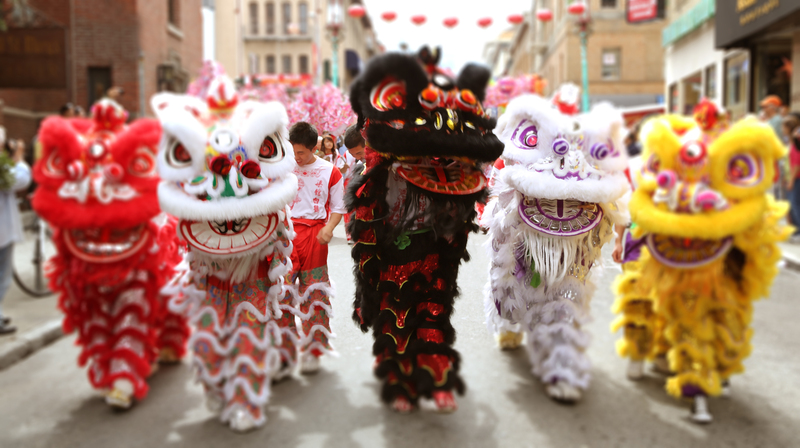 The lion dance is often mistakenly referred to as dragon dance. An easy way to tell the difference is that a lion is operated by two people, while a dragon needs many people. Also, in a lion dance, the performers’ faces are covered, since they are inside the lion. In a dragon dance, the performers can be seen since the dragon is held upon poles. Basic lion dance fundamental movements can be found in most Chinese martial arts. THE ANIMAL The lion is the king of animals. Although daring and brave, it is not as fierce as we think. Although it looks strong and powerful, it is benevolent and tame. Its heroic outlook instills fear in other animals. For thousand of years, the Chinese people respect and impress these qualities of the lion. Its status is on par with the symbolic dragon, phoenix, and Qi Lin in the Chinese epic. In fact, there are no real lions found in China. Descriptions of lions came to China from India though the spreading of Buddhism. From the historical record, lion dance was started during the Han Dynasty. His Majesty Han Wu Ti made commercial ties with the West through the Silk Road to China. Cultural interaction by means of functions in the palace in welcoming the guest from the West, like dances and songs were performed. During the performance, the dancers wore the mask of animals so as to entertain the guest. When the guests later discovered that no real lions lived in China, the Silk Road traders from the west began to bring real lions as gift to China. They also brought along their lion trainers. Nowadays, lion shows (similar to those found in Western circuses, with lions jumping through flaming hoops) take place in China as well. According to the folklore, the art of lion dancing had started since thousand years ago in China. In ancient days, the people found it difficult to meet the lion. So, the impression towards the lion was a sense of ambiguous. With the historical changes, like the cultural revolution and the influence of various religions, arts and sports, led to the transformation of various aspects of culture within races and the ethnic group in China. The lion dance movement change according to progress of history. 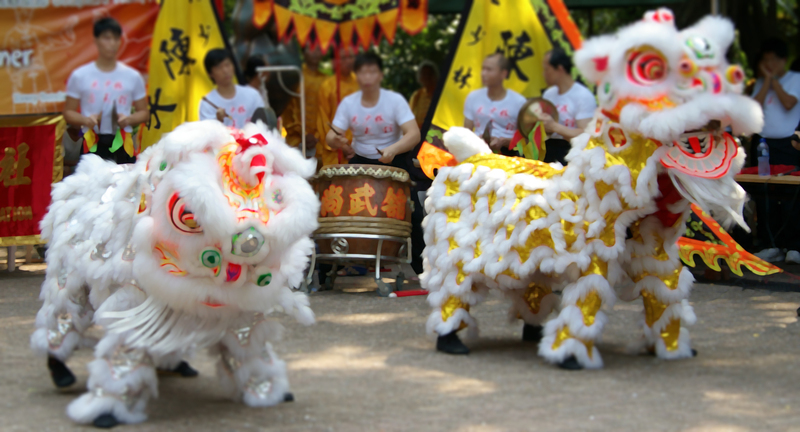 Contemporary lion dances should be categorized into 2 categories. Northern lions and Southern lions. According to the historical points of view and the record of the old “Tang Shu” music which has the contents of Tai ping yue (Tai Ping Rhythm) in Zhou Wi Ti Era. The Tai Ping Rhythm has a phrase that says: “There are 5 area of lion dancing. The lion dance was performed with people covered with lion-liked furry outfits. Two other performers using the rope and ribbon played around the lion that stands at their respective places”. According to another historical writing, during the Chow dynasty, lion dance has existed long ago. The great poet of Tang Dynasty, Bai Qi Yi in his poetry describe clearly about lion dance in his book entitled “Xi Liang Zhi”. From the writing Xi Liang Qi, It states, the people wear a mask and fake lions which made out of wood and the lion head’s eye are gold in color, silver tooth and furry outfits. By their performance, it tells a story. The lion dance had been in China before Tang Dynasty. 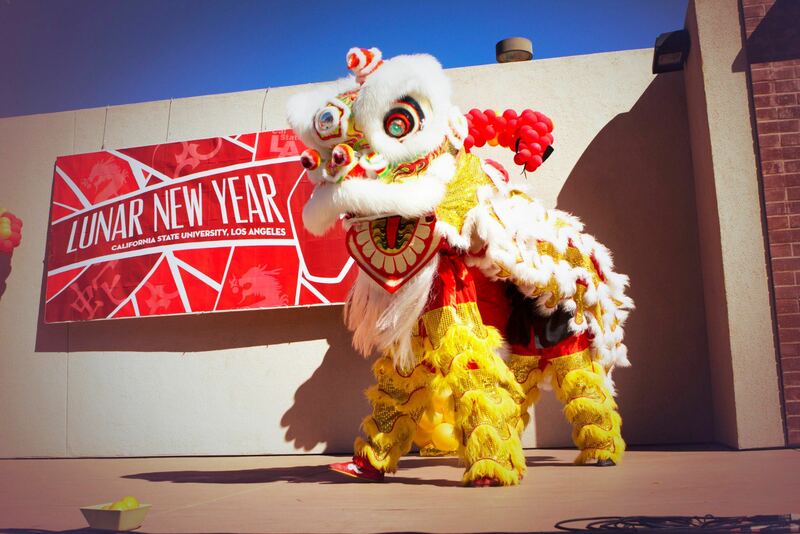 The costume wore by the lion dance today were more like the northern lion of today. From the book of ancient record, lion was from India and Ceylon (Sri Lanka). The status of lion in Buddhism was like the holy guard of the religion. With the spreading of Buddhism into China, about the time of dynasties of Han, Wei, and Chin, lion dance flourished. In China, there are elements of Buddhism, Taoism, and Confucianism which make lion dance look mysterious. The lion dance became a spiritual rite to be performed during important occasions and festivals. From the dynasties of Tang, Sung, Yuen, Ming and Ching and from the kingdom palace to the mass people, farming societies and deities’ festivals, the lion dance was one of the main agenda the organizers must not go without. 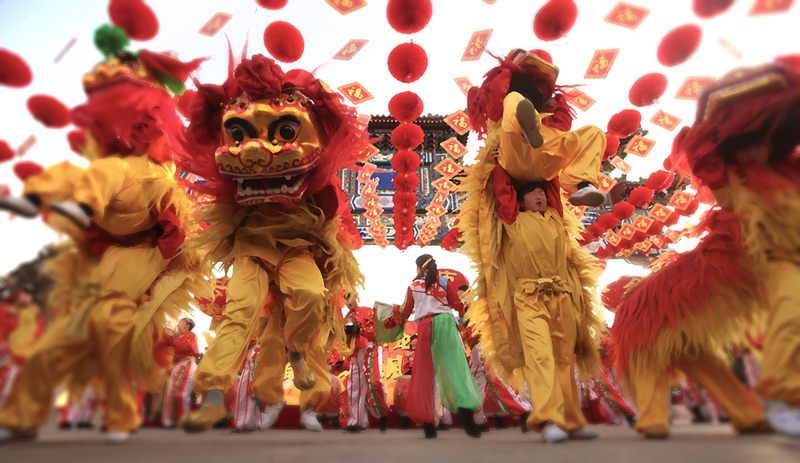 The transformation of lion dance went along with changes of time and dynasties in China. From north to south, in various part of China, it was belief that during the time of Wei Wu Ti, the lion dance started to spread to people mostly in the northern region of Yang Tze Kiang from the place. During the years North Wei, Wei Wu Ti called the Northern Lions as “North Wei Lions” This continues till South Song’s period when it was rename as “Northern Lion” Due to the external physical features of lion and the “Peking Dog” was somewhat alike, with golden long fur and all its body, the lion dance also carried the names of “Jing Shi” mean Golden Lion. The northern lion performance normally was carried out with one pair of adult lions and one or a pair of young cub together with one, two or three martial arts exponents to lead the team. Besides the lions were identified with ribbons or colors on their heads, Red for male, green for female, Northern lion dance emphasize on agility and flexibility, graceful and benevolent. The culture of various races and ethnic group in China also influenced the movements of the lion dance. From the northern region, the lion spread to the southern region. There were so many versions and story related to the start of southern lions. There were many type of categories of southern lions base on their forms and different characteristic. For example, the Kek Clans had their “Bull-Type Lion” and “Leopard-Type Lion”, while the Hokkien Clans has “Green Lions’ and so on. There were circumstances aroused and believed that southern lion became very popular. Southern lion was originated from Guang Dong so it was called Cantonese lions. During the early time, it was called the “Rui Lion” meaning Auspicious Lion. This name was use until the late Qing dynasty till the 17 years of “Ming Gua” (people replublic of China). This name changes after the 3rd May 1928 incident where many Jingnan people of China were tortured and killed by the Japanese and China was name as “The Sick Asians”. The name was change because the word “Rui”- Auspicious in Cantonese is pronounce as “Shui”-Sleeping. So, in Cantonese it is pronounce as sleeping lion instead of auspicious lion. When the Chinese people awoke and realized the importance of nationalistic, the “Rui-lion” was change to “Shing” Lion which mean Awaken lion. At Futshan and Hoksan, Guang Dong, the origins of the “Awaken Lion”, martial arts and lion dance school combines the skills of kung fu . Awaken Lion stressed on martial arts skills were popular among the masses. Southern lion dance during that period of post Ming and Pre Qing Dynasty motivated and influence the spirits of nationalism of the people. This is because of the unsatisfactory against the Qing government and various rebellious act was take place to restore the Ming. From there on, the lion dance spread to vast area of Guang Dong. The Chinese Northern Lion (北獅) Dances are usually performed appear in pairs in the north China. Northern lions have shaggy orange and yellow hair with a red bow on its head to indicate a male lion, or a green bow to represent a female. During a performance, northern lions resemble Pekingese or Fu Dogs and movements are very lifelike. Acrobatics are very common, with stunts like lifts or balancing on a giant ball. Northern lions sometimes appear as a family, with two large “adult” lions and a pair of small “young lions”. Ninghai, in Ningbo, is called the “Homeland of the Lion Dance” (狮舞之乡) for the northern variety. The Chinese Southern (南獅) Lion dance originated from Guangdong, the homeland of the Chinese southern style lion. The Chinese southern horned lions are believed to be Nians. The Guangdong’s or Cantonese style can be further divided into Fut San (Buddha Mountain), Hok san (Crane Style), Fut-Hok (minor style that exhibits a hybrid of Fut San and Hok San), Jow Ga (minor style performed by practitioners of Jow family style kung fu, exampled by the Wong People), and the Green Lion (Qing1 Shi1 – popular with the Fukien/Hokkien and Taiwanese). The styles of lion dance do vary widely, but the lion head designs exhibit greater differences. The traditional Fo Shan lion has bristles instead of fur and weighs more than the current in-fashion ones. The tails are extremely long and are perpendicular to the head for three fourths of the tail’s length, then it goes parallel to the head. The eyes also swivel left and right. On the back there are gold foiled rims and traditional characters saying the troupe’s name. Older Liu Bei lions also have black in the tail while the new ones do not. The Gwan Gung has a red and black tail with white trim. The Huang Joon has a full yellow tail with white trim. The Zhang Fei has a black and white tail with white trim and a white underside. The Zhao Zi Long lion is a green lion with a green tail with black trim and also a white underside. All the traditional style Fo Shan have pop-up teeth, tongue, swivelling eyes, and a gold gilded area on the back for the school’s name and also the underside of the tail is white; the designs of the tail are also more square and contain a diamond pattern going down the back; it is also common to see and hear bells attached to the tail. Although most lion dance costumes comes with a set of matching pants, some practitioners use black Kung-Fu pants to look more traditional. The Wong people perform the lion dance using this type of lion. The newer styles of lions for Fo Shan replace all the bristles with fur and the tails are shorter. They eyes are fixed in place, and the tongue and teeth do not pop up. The tail is more curvy in design. The tail does not have a diamond pattern, and lacks bells. In addition, the dancers wear flashier pants which lack the ease of movement allowed when wearing Kung-Fu pants. Sometimes the newer versions use a sequin material over the traditional lacquer; even the new lacquer is shinier and does not last as long while the heavier ones do last longer with semi-dull lacquer. Recently, lion dance costumes are made very durable and some are even waterproof. Newer lions are made with modern materials such as an aluminium and laser stickers for the outer designs, while the traditional ones use bamboo and more durable layered cloth. Fo Shan is the style many Kung Fu schools adopt. It requires powerful moves and strength in stance. The lion becomes the representation of the Kung Fu school and only the most advanced students are allowed to perform. The He Shan style lion, popular in many places, has grown to fame because of its richness of expression, unique footwork, magnificent-looking appearance and vigorous drumming style. The credit should go to the founder, the “Canton Lion King” 冯庚长( Feng Geng Zhang). According to records, 冯庚长was born in “沙坪越塘大朗村” village in He Shan county. His father was a secular disciple of the Shaolin Temple, and instructed him in martial arts and lion dance at an early age. Later, he further studied martial arts and Southern lion dance in Fuo Shan with fellow villager 冯了性 (a famous physician and the creator of this dance), before returning to his hometown and setting up his own training hall, teaching and researching the art of lion dance with great devotion. Given his considerable martial ability, a result of hard and dedicated training, he was able to develop a unique and outstanding version of lion dance. 冯庚长 was not only able to carry on the art, he was also particularly involved in creating new techniques through mimicking. Together with his junior 胡沛, he kept cats and studied their behaviour carefully; they were eventually able to incorporate from the “cat and mouse game” the various movements such as “Catching mouse, playing, catching birds, high escape, lying low and rolling”. They also made changes to the body of the Fo Shan lion, making it more well-built and powerful in structure, but with agile footwork and eye-catching colours, and played to the rhythm of the “Seven Star Drums”. In short, in terms of expression, dance steps, build of the lion and the drumming style, he created a whole new style of lion dancing which was considered high in entertainment value and visual appeal. There are many important points which also prove 冯庚长 to have been the chief figure responsible for the creation of the He Shan style of lion dance. In the early 1920s, the He Shan lion dance was performed at Sun Yat-Sen’s assuming office in Guangzhou, creating quite a sensational stir both within and outside of the province. Around 1945, He Shan lion performers were often invited to perform in many places within China and Southeast Asia during many celebratory festivals. The He Shan style was strongly favoured and sensational in Singapore, having been featured in many nationwide events, even gaining the title of “Lion King of Kings”, with wide press coverage by both Chinese and English media. The noble bearing of the He Shan lion is still promoted as a tourist attraction in Singapore today, with a large banner featuring this style being placed on the tourist attraction of Sentosa. According to 冯昆杰, today’s He Shan lions are the same as those created by 冯庚长 by improvising on the Fo Shan lion; it is of a powerful and impressive build, with a “王” character on its forehead and a confident expression, and combined with the unique invention of 冯庚长, the “Seven Star Drum”, the He shan lion displays a formidable show of power. 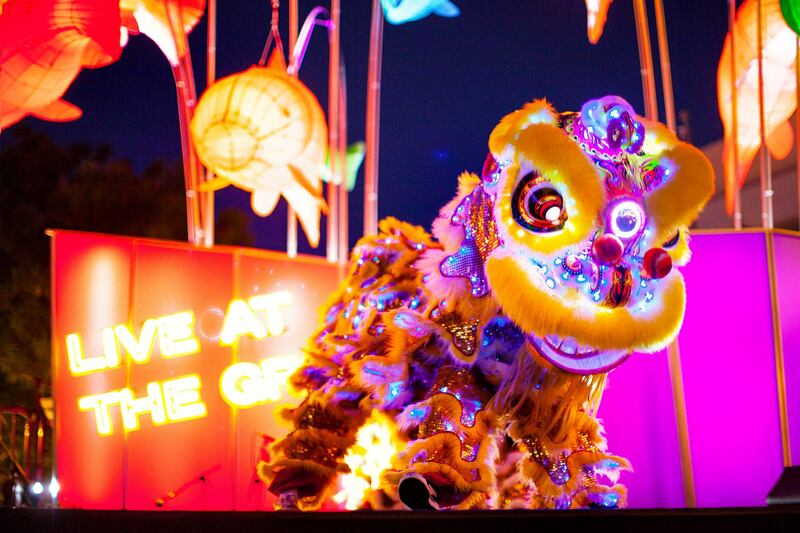 When the Fo Shan lion dance was brought to Singapore, a lot of works have been done to make the lion more ” cat-like”. Master Ho Kai Seng of Singapore He Shan Association shortened the tail of He Shan lion so that it looks more like a cat. And master Liang Zhao Fu, who is wildly known as South-east Asia drum king, created Fo Shan 18 beats and devised a way to play the drum with not just rhythms but also gusto. The He Shan drum nowadays is composed by master Lu Xin Yao of Singapore He Shan Association. There is three important and the first colors of the lions. The lion with the white colored fur is considered to be the oldest of the lions. The lion with the goldish yellowish fur is the considered to be the middle child. Not the youngest or the oldest. And the black colored lion is considered to be the youngest lion so when people use this colour lion it should move fast and quick like a young child. When the dancing lion enters a village or township, it is supposed to pay its respects first at the local temple(s), then to the ancestors at the ancestral hall, and finally through the streets to bring happiness to all the people. There are three types of lions: the golden lion, representing liveliness; the red lion, representing courage; and the green lion, representing friendship. Three other famous lion types can also be identified: Liu Bei, Guan Gong (Cantonese: Kwan Kung) and Zhang Fei. They represent historic characters in China that were recorded in the classic, Romance of the Three Kingdoms. These three were blood oath brothers that swore to restore the Han dynasty. The Liu Bei (Cantonese: Lau Pei) lion is the eldest of the three brothers and has a yellow (actually imperial yellow as he became the first emperor of the Shu-Han Kingdom) based face with white beard and fur (to denote his wisdom). It sports a multi coloured tail (white underside) with black as one of them which encompasses the colors of the five elements, as it was believed that being the Emperor, he had the blessings of the heavens and thus control of the five elements. There are three coins on the collar. This lion is used by schools with an established “Sifu” (Martial art master) or organization and is known Rui shih (Shui Shi) or The Auspicious Lion. The Guan Gong (Cantonese: Kwan Kung) lion has a red based face, black bristles, with a long black beard (as he was also known as the “Duke with the Beautiful Beard”). The tail is red and black with white trim and a white underside. He is known as the second brother and sports two coins on the collar. This Lion is known as Hsing Shih (Shing Shi) or the Awakened Lion. This lion is generally used by most. The Zhang Fei (Cantonese: Cheung Fei) lion has a black based face with short black beard, small ears, and black bristles. The tail is black and white with white trim and a white underside. Traditionally this lion also had bells attached to the body, which served as a warning like a rattler on a rattle snake. Being the youngest of the three brothers, there is a single coin on the collar. This Lion is known as the Fighting Lion because Zhang Fei had a quick temper and loved to fight. This lion is used by clubs that were just starting out or by those wishing to make a challenge. Later an additional three Lions were added to the group. The Green faced lion represented Zhao Yun or Zhao (Cantonese: Chiu) Zi Long. He has a green tail with white beard and fur and an iron horn. He is often called the fourth brother, this lion is called the Heroic Lion because it is said he rode through Cao Cao’s million man army and rescued Liu Bei’s infant and fought his way back out. The Yellow (yellow/orange) face and body with white beard represented Huang Zhong (Cantonese: Wong Tsung), we was given this color when Liu Bei rose to become Emperor. This lion is called the Righteous Lion. The white colour lion is known as Ma Chao (Cantonese: Ma Chiu), he was assigned this color because he always wore a white arm band to battle against the Emperor of Wei, Cao Cao, to signify that he was in mourning for his father and brother who had been murdered by Cao Cao. Thus this lion was known as the funeral lion. This lion is never used except for a funeral for the Sifu or some important head of the group, and in such cases it is usually burned right after. Even if it is properly stored, it is not something one would want to keep, as it is symbolically inauspicious to have around. It is sometimes though, confused with the silver lion which sometimes has a white like colouring. These three along with Guan Yu and Zhang Fei were known as the “Five Tiger Generals of Shun,” each representing one of the colors of the five elements. There are various Taiwanese Lions. They are different from the Chinese Southern Lions in various aspects. The lion styles can be roughly divided into open-mouth lions (開口獅) and closed-mouth lions (閉口獅). It is known that the Taiwanese lion heads are very colourful, and have large eyes, a mirror on their forehead and horns, while the heads of the Chinese Southern Guangdong-style lion are decorated with fur around the eyes and the forehead. Unlike the Chinese Southern Guangdong-style lion whose eyes and mouth can be moved, the Taiwanese lion is less elaborate. The Taiwanese dance also integrates with martial arts to a greater extent (less like circuit tricks). In addition to dance steps, the Taiwanese lion dance also uses different musical instruments and tempo. The eight trigrams lion dance is the tradition of Beigang (北港), where Chaotian Temple (北港朝天宮) is visited by more than one million pilgrims every year. Nowadays, many Taiwanese schools provide lion dance trainings. Japan also has a tradition of lion dance throughout the nation, dancing in pace with the music. Known in Japanese as “Shishi-mai,” the roots of the Japanese lion dance are said to be from China. The style of dancing and design of the lion differs by region. The lion dance has been completely absorbed into Japanese tradition and is used even in religious Shinto festivals aside from new year celebrations. The Japanese lion consists of a wooden, lacquered head called a “shishi-gashira” (lit. Lion Head), and a characteristic body of green dyed cloth with white designs. It can be manipulated by a single person, or two people, one who manipulates the head. As with Chinese lions, the make of the head and designs on the body will differ from region to region, and even from school to school. In Okinawa, a similar dance exists, though the lion there is considered to be a legendary shisa. The heads, bodies and behavior of the shisa in the dance are quite different than the shishi on mainland Japan. Instead of dancing to the sounds of flutes and drums, the Okinawan shisa dance is often performed to folk songs played with the sanshin. In Korea, the lion dance survives in a tradition called “Saja-nori.” Although there are several other lion dances as part of Korean mask plays, Bukcheong Saja-nori is peculiar in that it is exclusively composed of lion dance, unlike other mask play traditions. In addition, it requires special attention because it is not at all similar in shape or technique with those of other Asian countries, such as China and Japan. The Korean lion, or “saja,” is a costume manipulated by two or three performers. The head of the lion consists of a flat, round, grotesque-looking mask with bells hanging from it. Like its Chinese and Japanese counterparts, it is performed during the lunar new year celebration to scare away evil spirits and beckon good luck. Lion Dance is performed accompanied by the music of beating of drums, cymbals, and gongs instruments synchronise to the lion dance movements and actions. The recent development of an application played on iPhone/iPad/iPod touch to play lion dance instruments has contributed to the evolution of how people can play lion dance music. The lion dance costumes used in these performances can only be custom made in speciality craft shops in rural parts of China and have to be imported at considerable expense for most foreign countries outside Asia. For groups in Western countries, this is made possible through funds raised through subscriptions and pledges made by members of local cultural and business societies. For countries like Malaysia with a substantial Chinese population, local expertise may be available in making the “lion” costumes and musical instruments without having to import them from China. The lion dance (especially the Taiwanese Lion, 臺灣獅) has close relations to Kung Fu or Wǔshù (武術) and the dancers are usually martial art members of the local kung fu club or school. They practice in their club and some train hard to master the skill as one of the disciplines of the martial art. In general, it is seen that if a school has a capable troupe with many ‘lions’, it demonstrates the success of the school. It is also generally practised together with Dragon dance in some area. Different types of vegetables, fruits, foods or utensils with auspicious and good symbolic meanings; for instance pineapples, pamelos, bananas, oranges, sugar cane shoots, coconuts, beer, clay pots or even crabs can be used to be the “greens” (青) to be “plucked” to give different difficulty and challenge for the lion dance performers. But the difficulties of the challenge should comes with the bigger the rewards of the “red envelope” given. The lion dance, sometimes along with the dragon dance, is also usually performed at many other important grand occasions, including Chinese traditional, cultural and religious festivals, business opening events, birthday celebrations, honor guest welcoming and wedding ceremonies by the Chinese communities. In the old days, the lettuce was hung 15 to 20 feet above ground and only a well-trained martial artist could reach the money while dancing with a heavy lion head. These events became a public challenge. A large sum of money was rewarded, and the audience expected a good show. Sometimes, if lions from multiple martial arts schools approached the lettuce at the same time, the lions are supposed to fight to decide a winner. The lions had to fight with stylistic lion moves instead of chaotic street fighting styles. The audience would judge the quality of the martial art schools according to how the lions fought. Since the schools’ reputation were at stake, the fights were usually fierce but civilized. The winner lion would then use creative methods and martial art skills to reach the high-hanging reward. Some lions may dance on bamboo stilts and some may step on human pyramids formed by fellow students of the school. The performers and the schools would gain praise and respect on top of the large monetary reward when they did well. Nowadays, performances to attain the red envelope are not as rigorous but lion dance troupes still have the onus of making a good show or face the consequence of an unhappy client. During the 1950s-60s, in some areas with high population of Chinese and Asian communities especially the Chinatown in many foreign countries abroad China in the world; people who joined lion dance troupes were “gangster-like” and there was a lot of fighting amongst lion dance troupes and kung fu schools. Parents were afraid to let their children join lion dance troupes because of the “gangster” association with the members. During festivals and performances, when lion dance troupes met, there would be fights between groups. Some lifts and acrobatic tricks are designed for the lion to “fight” and knock over other rival lions. Performers even hid daggers in their shoes and clothes, which could be used to injure other lion dancers’ legs, or even attached a metal horn on their lion’s forehead, which could be used to slash other lion heads. The violence got so extreme that at one point, the Hong Kong government had to put a stop to lion dance completely. Now, as with many other countries, lion dance troupes must attain a permit from the government in order to perform lion dance. Although there is still a certain degree of competitiveness, troupes are a lot less violent and aggressive. Today, lion dance is a more sport-oriented activity. Lion dance is more for recreation than a way of living. But there are still plenty of troupes who still practice the traditional ways and taboos of the lion dance as it is practiced in the past. In the 1960s and 1970s, during the era when the Hong Kong’s Chinese classic and martial arts movies are very popular, Kung fu movies including Jet Li’s “Wong Fei Hung” has actually indirectly shows and indicates how lion dance was practised with the Kung fu close co-relation and Kung fu during that time. Those days, the lion dance was mostly practised and perform as Wushu or Kung fu skills, with the challenge for the ‘lion’ built of chairs and tables stack up together for the ‘lions’ to perform its stunts and accomplish its challenge. Several 1990s movies, including a remade version of “Wong Fei Hung”, and the sequels of Once Upon a Time in China, involve plots centered on Lion Dancing, especially Once Upon a Time in China III and IV. The series main actor, Jet Li has performed as a lion dancer in several of his films, including Southern style lion dancing in Once Upon a Time in China III, Once Upon a Time in China and America and Northern style lion dancing in Shaolin Temple 2, and Shaolin Temple 3. The new movie Hop features a lion and other commercials feature it such as, Vitamin Water Revive and Subway. 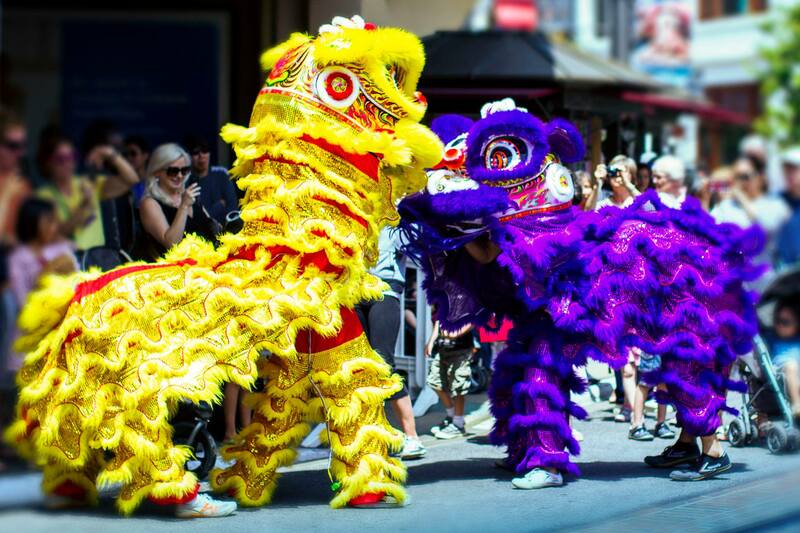 Lion dance has spread across the world courtesy of the local Chinese community and immigrant settlers located at different Americas, Europe, Asia, Africa, Pacific and Australia continents and countries worldwide including South East Asia’s Malaysia. It has evolved a lot since the early days when it was perform as a skill part of martial arts of Wushu and grown into a more artistic arts and skill which take into accounts the lion’s expression and the natural movements beside the acrobatic styles and skills during performances. This was apply during whether it is performed as a cultural performances or as a stunt during competitions. This evolution and development has eventually lead to the modern form of lion dances and the new lion dances on the stilts competition based on the best skilled and most lively “lion” coupled with the most creative stunts, choreographed moves, acrobatics difficulties and heart-throbbing rhythmic and pulsating live instrument music to captivate spectators and the judges in the competitions. It is said and recognized that the Malaysian influence and efforts all this while has contributed a lot to the popularity of the practice and performances of the form of lion dance on stilts that turn the lion dances into a more interesting and attractive popular arts. Most of the lion dance world championships were held in Malaysia with its representing troupes winning most if not all the championship thanks to the great efforts and initiatives by the Chinese community that creates many lion dance experts, performers and fans.